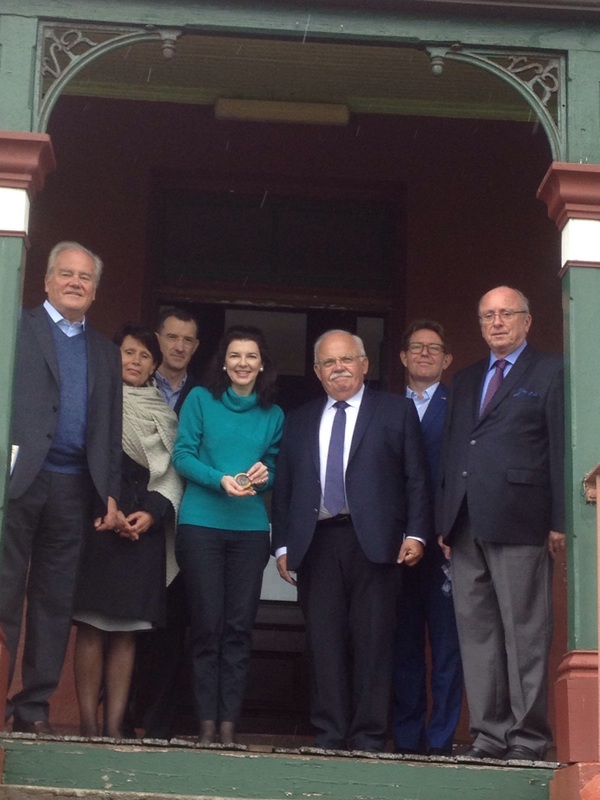 Sunday September 18, 2016 a delegation from the French Senate visited the Lapérouse Museum Sydney. Nicole Forrest Green our President discussed the challenges that lay ahead for the Museum in the midst of great change as the NSW Minister for Heritage and the Environment, the Hon. Mark Speakman MP awaits an administrative process to sign a new Management Lease for the Museum to Randwick City Council where funds have been set aside for renovation, repairs and improvements to the site. 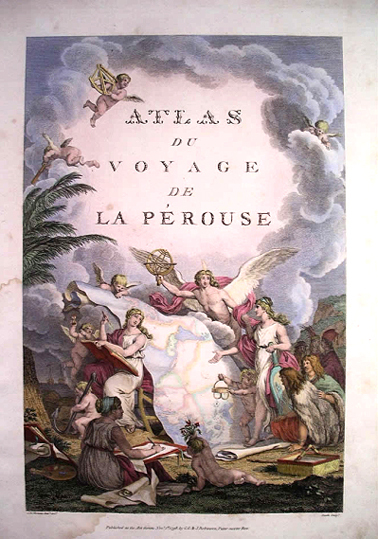 The Group was shown the area Laperouse landed and his story as it unfolded across the Pacific taken from the pages of his famous ‘Atlas de Voyage’ saved by both Barthélémy de Lesseps and British Naval Officers from Arthur Phillip’s first fleet that transported records of the French expedition back to Europe on their behalf, a custom of the day that protected records from potential accidents, natural disasters or other problems. The visiting Délégation comprised Members of the French Senate’s Commission for Foreign Affairs, Defence and France’s Armed Forces presided by Senator Christian Cambon (Val-de-Marne) and a very clever lady Senator Marie-Francoise Perol-Dumont representing the Haute-Viennes region of France. Senators Christian Namy and André Trillard were delighted with the historical ties between France and Australia that date back to the earliest days of European settlement in this country, 1788. Senator Trillard spoke of the great shipbuilding skills of his region that had recently overseen the reconstruction of a replica of the 18th Century Navire ‘L’Hermione‘ that brought liberty and freedom to the United States of America transporting Lafayette and assistance to help insurgents in the American Revolutionary War against the British. Lapérouse himself had also met with General Washington in 1781. The idea has also been raised in a number of quarters to rebuild ‘l’Astrolabe’ a topic of great interest. 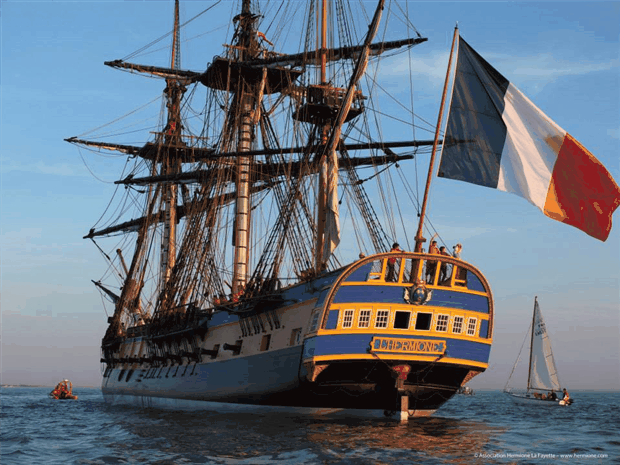 France’s skill and expertise in naval affairs has recently taken centre stage in the Australia-France relationship to the delight of the visiting delegation. The Group were accompanied also by the French Consul General to Sydney M. Nicolas Croizer and France’s Defence Attaché to Australia Captaine Yann Marboeuf FN. Lise Ménager Advisor to the Commission, was also in attendance. Nicole Forrest Green was presented with an extraordinary gift – an historical Royal naval medallion from Senator André Trillard in appreciation of the ties that bind our two nations.